Though there aren't people born as old men and women and grow young... 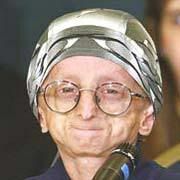 I found out today about these kids who are born with a condition known as Progeria, which causes the body to age seven to eight times faster than normal. At eight years old, they have the bodies of 75 year olds. The average life span is 13 years. These little children die of heart attacks and similar age-typical diseases and ailments at very young ages.